Knob locks are probably the most common type of door lock in existence. It is one of the most simple and basic security products. The doorknob itself has a locking mechanism that typically requires a key for entry, and this can be used on exterior as well as interior doors for privacy and safety. Knowing what a knob lock is and choosing the best one for your home are two different things. For exterior doors, you want one that is made of the strongest material and offers the most security. In some cases you can get them with a different type of locking mechanism than just a key; they may require a code or a swipe card instead. These are often harder to duplicate than a simple key. Professional security services like Hulk Security Systems will assemble and install the right locks for your home or business. For interior doors, you typically only need a basic knob lock for your doors. These can be push button locks which are not very secure but can offer all the security you need for a bedroom or bathroom door. They don't require a key since typically no one is going to be unlocking the door from the other side. They also don't need to be made from very strong materials since you don't need to worry about anyone kicking in the door when you install them on interior doors. Shop around for a good knob lock and superior security services when you're ready to upgrade your security system. This will mean knowing you have the security you need for exterior doors and the privacy needed for interior doors, without overspending on features you don't need for either type. There are many reasons to choose a knob lock for your interior and exterior doors, and they will add security and privacy for you and your property. A knob lock is just that; the lock is in the doorknob and can be worked with a key from the other side, or it may not have a key opening mechanism at all. Also, they are aesthetically pleasing home security products. You probably have a lot of knob locks in your home and office; the bathroom door or bedroom doors of your home usually have a knob lock, and most exterior doors will as well. They are a basic part of your home's security for exterior doors as they are the first step in keeping intruders out. When you want to enhance your home security from the most complex systems to the basics, like knob locks, security services in New York can help. For interior doors, you can choose a knob lock without a key mechanism. These are very basic and allow for privacy if not much security. As you choose the right knobs for your interior rooms, be sure you choose ones that are strong enough for the rooms in which they'll be installed. As an example, you may want to install a stronger knob lock for bedrooms in case of intruders or for rooms that may hold guns in the home or for a home office so they cannot be opened easily. These may be better with a key mechanism rather than just simple locks as this will add more security. For exterior doors, you can even add deadbolts and other security measures for the home. 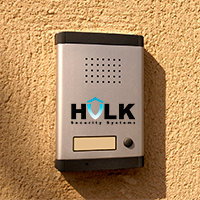 Home security products from Hulk Security Systems will keep everything safe.